Hola. I'd just like to add a few things. Used to go to a very wonderful functional medicine MD when I had Lyme. It's said Lyme patients sequester mercury in their bodies – or rather, that the Lyme bacterium sequesters the Lyme and utilizes it in its metabolic processing. Probably based on a study. Can't find it but plenty of Lyme literate MD's discuss mercury, mercury amalgam removal, and chelation of the body to remove mercury and other heavy metals. (BTW, Lyme patients usually have to detox their livers & ensure they have adequate lymphatic drainage.) What's suggeste for Lyme pt's is applicable to everyone. So if I can shed some light here & help, great. We're all hammered now in a toxic world, heavy metals coming at us from man-made radioactive waste & toxins. Plus the man-made clouds (aerosolized heavy metals – aluminum oxide, barium sulfate, thorium, among other things). Plus the vast array of heavy metal pollution from cars, industry, etc., etc. And aromatic hydrocarbons, the stuff from the petrochemical industry. PCB's, pesticides, herbicides. Bottom line – we have to process (and hopefully expel or inactivate) all of that…. So will share what I learned about detoxing (will try to be concise) & esp. mercury. Anything that addresses mercury will also help detox/eliminate many other heavy metals. So here's the gist of what I was taught. This really works – I couldn't function w/o doing this, and the difference in how I felt seemed pretty miraculous. Cilantro is the same as coriander. If you buy coriander dried, it's dried cilanto (fresh herb). Coriander also typically refers to the seed of the plant, or dried seed. It's mainly a packaging and processing thing. Fresh herb is typically referred to as cilantro. But the same plant. 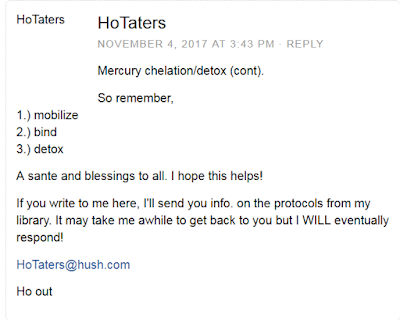 What was shared re: mercury detoxification was this: do not get any vaccines containing mercury. The EPA lowered the threshold of allowable exposure around 2006. But it has taken manufacturers years to use up all the old supplies which contain large amounts of thimerosal (mercury). About 3 weeks prior to amalgam removal, do the following. Continue through removal, and for about three weeks afterward. If you feel bad at all, continue awhile longer. Do the protocol apart from food and medicine, 2-4 hours in between. Take fresh cilantro, chlorella, citrus or grapefruit seed extract (diluted in water best). Citrus or grapefruit seed extract is easier on the gut if taken in capsule form. Dr. Dietrich Klinghardt has this on his website. I did the simplified version which worked great (discussed here). The cilantro mobilizes the mercury and heavy metals. The citrus or grapefruit seed extract will mobilize heavy metals in your brain, inside your bones, behind the blood/brain barrier. This is important! It also acts as a strong anti-parasitic and will cause Lyme cysts to break open and come out from behind the blood-brain barrier, where they hide. Organisms living in the gut and other tissues are flushed out of hiding and killed by the grapefruit/citrus seed extract. Note (important): parasites and organisms such as Lyme sequester heavy metals. And they produce neurotoxins when they die. Fungi are also killed in the process. This is all a good thing, but you can be left feeling poopy-toxic by the neurotoxins and heavy metals, other toxins being released into the bloodstream and gut. You MUST bind and remove these toxins. Otherwise, they travel through the blood, cause lymph stagnation, and will make you feel terrible. The neurotoxins alone can make you feel like you're going to die. It's also horrible for your liver. If you mobilize mercury just by taking cilantro, it will re-deposit in your tissues if not bound. This usually occurs through re-deposition in fatty tissues – like the brain and kidneys. Can be very damaging. So – we have mobilized the toxins, heavy metals, if taking citrus seed/grapefruit extract (which is a great mobilizer in itself), we've also likely killed parasites, fungi, and bacteria. Now we have to mop up. Start that process about 2 hours after starting the mobilization. My MD told me to use activated charcoal to mop up the mess. So that's what I did. Worked great, felt really great afterward. Activated charcoal is one of the greatest ways to do finish the chelation process, bind toxins in the gut, and remove them. So is food grade fossil shell flour (diatomaceous earth – make sure it's free of contaminants). Ditto for bentonite, montmorillonite clay. Zeolite (in different forms, some consider micronized best). Have used fulvic acid too. A clean source of Shilajit (Ayurvedic formula) is good. Or just fulvic acid as a supplement. The ground rule for all the binders is make sure they are not contaminated. Malic acid can be used for chelation but I'm not exactly sure what a good protocol is for its use. You'll want to replenish your minerals afterward, and about 6 hours before or after this protocol. Clays, DE, and zeolite can pull minerals from the body, as well as heavy metals. I recommend drinking alkaline water (pH above 7.0, at least 7.35, which is normal blood pH). Raises water pH, and calming, helps replenish some of the electrolytes. You may get diarrhea using this protocol, so you'll want to get your minerals so you don't beocme dehydrated! I'd never use Mugwort w/o being supervised by a naturopath, MD, integrative or functional medicine doc. It's super powerful, not to be toyed with IMHO. Sure kills parasites though, almost instantly the little boogers begin to rebel & run for their lives! OK, so milk thistle is great for detoxing the liver. Best taken earlier in the day. Yellow dock good, but would consult a doc on that. Buplerum is good too. As are some Traditional Chinese Medicine (TCM) herbs, but doc should supervise on TCM. I used Tangerine Peel sourced through Humboldt Herbals (Plum Flower brand) to detox the liver. Yummy and fairly benign. Also, Asian pears are very astringent and will pull tons of toxins from the liver. Red root tincture, burbur tincture, far infrared saunas, saunas, exercise using large muscle groups are all good for purging the lymphatic system. A lot of the toxin burden, esp. neurotoxins from organisms like Lyme, get dumped into the lymphatic system, causing stagnation. It can make you feel horrible, like you're going to die! Or crazy and agitated. Or both! My personal experience is stagnation of the liver, kidneys, and lymph cause most of the horrible "herx" (dieoff) and poopy toxic feelings in the body, post-cleanse. Willigers, are we at the point that a blood filtration will be combined with our home reverse osmosis system? Phrases and meaning changes as we evolve, I don't know if this is progression. 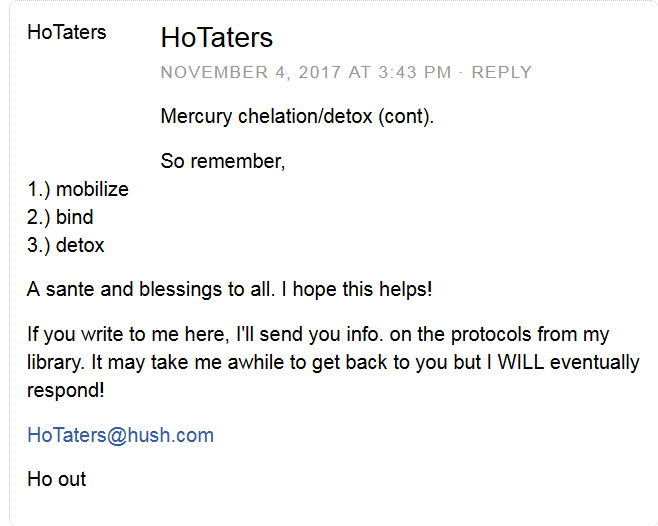 I'm almost 60yrs now, detox was an AA meeting. Heavy Metal was attending a Metallica concert. Activated charcoal, I either changed the filtration in the fish tank or lit the Weber. Cool a new product line, let me get right on that, lol.